Not far from where I live in Oakville is the city of Hamilton, where I studied at McMaster University and attended Central Presbyterian Church in my twenties. Strangely, it wasn’t until two summers ago that I discovered one of its best kept secrets: the garden at Dundurn Castle. If you are, like me, dreaming up ways to spend your summer vacation, you should definitely plan to visit. It is important to point out that Dundurn Castle isn’t actually a castle. It seems that the neighbours of Sir Allan Napier MacNab, one of Canada’s first premiers, were just a wee bit jealous of his new house and took to referring to it as his ‘castle’ (I sense a little bit of sarcasm there). Nevertheless, it is a beautiful three-floor home that took several years to build and where MacNab, a lawyer and good Presbyterian, lived during the mid 1800’s. Forty rooms have been carefully restored and costumed guides offer visitors a peek into the life of Victorian-era Canadians. That is all well and good, but it is the garden that is the real show stopper. Designed in a Scottish style, it is a very large walled garden with straight paths and a stunning variety of flowers, fruits and vegetables. It is part of a recent landscape restoration project in the area and has been carefully restored to 1855. The garden was originally designed and kept by master gardener William Reid, who worked for MacNab for some twenty-five years. It is has a tidy, symmetrical design that includes long rectangular raised beds and espaliered fruit trees (trees planted and pruned to grow flat against the fence). 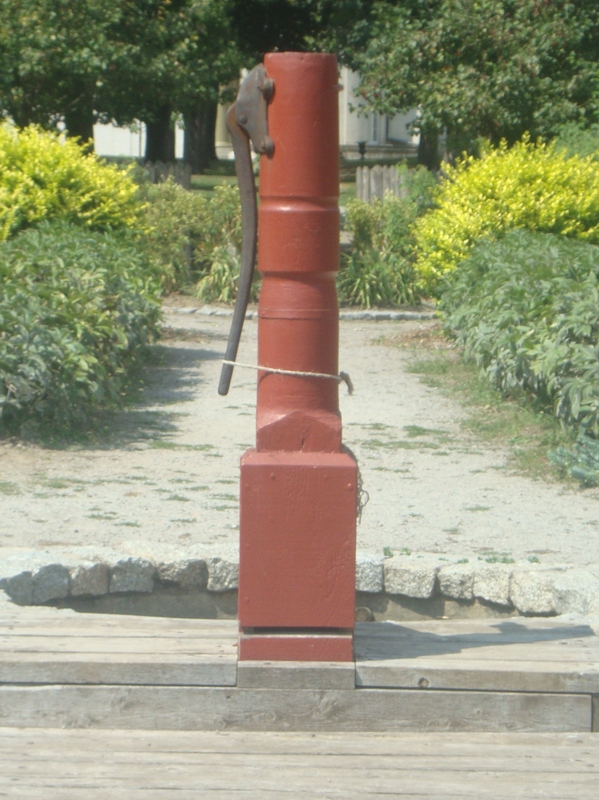 At one end is a small hand pump, and at the other is a modest wooden shed. This is where they house any herbs or flowers being dried for the winter, along with the only gardening implements they use–hand tools. Yes, they are that keen on being historically accurate. The historical accuracy doesn’t stop there, mind you. Those who tend the garden do so in period costume–long cotton dresses–which I think would be perfect for sun protection but perhaps a little cumbersome for weeding and digging! All of the plant varieties are those that would have been grown or available in Canada in 1855, too. When we visited, I recognized many of them–marigolds, eggplant, borage and the like. There were others, however, that I didn’t recognize at all. Thankfully, our guide offered fascinating conversation and stopped to explain plants I had never seen, such as the ‘lily iris’. Usually called a ‘blackberry lily’ it has pretty orange flowers on iris-like foliage, and develops large black seeds that resemble blackberries (hence the name). She generously plucked a few seeds off and said “Here, take them. They’ll grow anywhere!”. With a background in archaeology and a Dutch heritage that taught her a thing or two about gardening, our guide offered impressive knowledge and answered every single one of our questions. I was so excited to hear about how the produce grown in the garden is used not only to furnish the needs of the museum with its cooking demonstrations and Christmas decorations. All that is left over is shared with nearby food programs, so that everything grown is put to good use. I love that. As we walked along the paths between beds of melons, lavender and tomatoes, we talked about whether the garden would have been strictly for producing the food and herbs needed in the kitchen, or whether anyone might have visited it for pleasure. My guide assured me that wandering through the garden and noting its progress would indeed have been done regularly. Strolling through rows of bright colours and being surrounded by beautiful scents would have been considered healthy and enjoyable. And indeed it was. We were there for the better part of an afternoon, and I would have happily stayed longer. It was restful, but also engaging. Beautiful, but also functional. A museum, but also food for the hungry in today’s world. Like I said, you should go. This entry was posted in Uncategorized and tagged garden, Horticulture, landscaping. Bookmark the permalink. Adding it to the list, thanks! I needed to see pictures of flowers in bloom today! It is bitterly cold here. Yes. Here, too! I was trying to remember what it felt like that day I took the pic’s at Dundurn Castle…hot humid and very sunny!